Buddy Thomas' version on you tube but couldn't. I do have Lonnie Donegan's version on an LP of mine. Surveys: At one point or another I had all three of those albums on the KYSN survey. 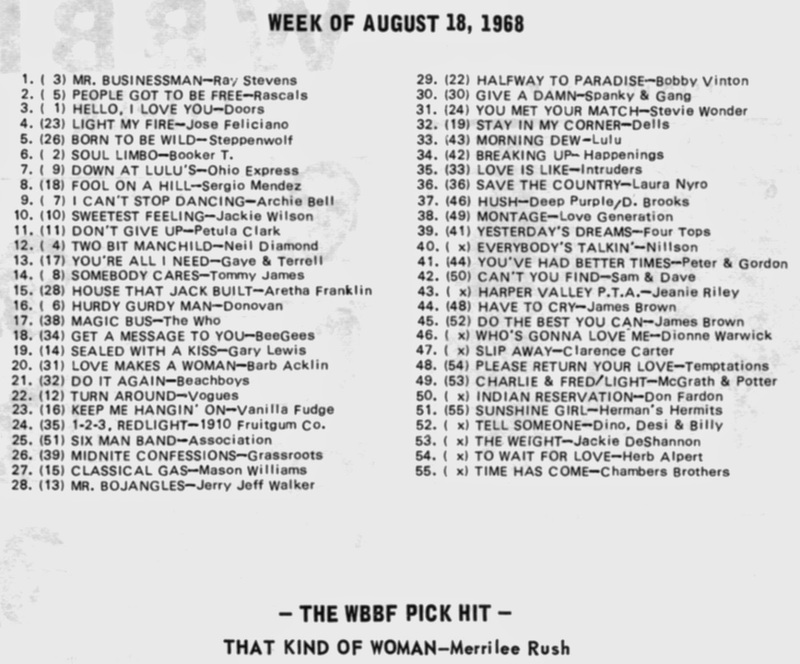 A point you failed to mention on the WBBF survey was that it was very unusual to see a survey issued as late as 1968 to have 55 songs listed. There's about 20 songs listed there that I never heard a note of on WLS or WCFL. Regarding the sorry state of radio today: Sorry to beat a dead horse here ... I meant to post this a couple weeks ago, although it was an old topic then, too. In July, I had to take a road trip from downstate Illinois to Chicago, about 300 miles. It's a trip I do every two months, so I'm familiar enough with the radio stations along the way to make the trip bearable. I could listen to CDs, but I get tired of having to change discs on the fly. However from Chicago I then continued on to Rochester, Minnesota, on personal business. Once I got into Wisconsin I had no luck finding any station I could listen to for any length of time. So on the way back, I did not have the radio on for the entire 9 1/2 hour drive home. Ironically it was a rental car and I didn't realize there was a CD player in the radio. (There was nothing on the radio unit saying CD player). Why is this ironic? Because I had eight crates of CDs ... about 600 discs ... in the trunk from the record show. I'm fairly sure there were some albums I could have listened to. Still silence was preferable to hearing the same songs I hear every day. Another great selections of surveys this week. But did you notice that the #1 Record the previous week on your 1963 chart was something called Please Don't Talk To The Lifeguard? I don't think I've ever heard that song before. What do you know about it? 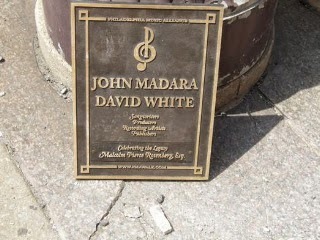 For John from Waupaca. All three of the groups he mentions were based in Milwaukee. The Robbs, Skunks & Tony’s Tygers. They did have members who were from outlying suburbs etc. They all had Chart success here, especially the Robbs. “Bittersweet” actually gets to #1 in Milwaukee. Today's posting was like old home week for me. I had completely forgotten about The Robbs and yet I know and love both of the songs you posted by them. Then having a reader ask about The Skunks and Tony's Tygers was just awesome. I did scroll back to the Tygers spotlight and I really got a kick out of them talking about playing with The New Colony Six at one time. This is just such a small world in which we live ... right? Thanks ... this posting really brightened my day! All of that is correct ... thanks for remembering. New restrictions placed on Reel Radio (after all these years) no longer allows them to air "unscoped" / unedited clips that are under five hours in length! How ridiculous! Most of these clips come from private collections and are only there as a reminder of how great Top 40 Radio sounded back in the day ... nearly ALL of our favorite jocks have a presence on this website ... and this new regulation has GREATLY limited our listening enjoyment. Last night I spoke for about 30 minutes with Bruce Johnston after the Beach Boys Show in Williams Bay, Wisconsin. Bruce was the producer of Bluebirds Over The Mountain, this Beach Boys' late 1968 release that reached top 20 in a bunch of cities across the country (top 10 in Netherlands according to Wikipedia). It was sandwiched between Do It Again and I Can Hear Music, each having a more distinctive Beach Boys sound. We did not discuss Bluebirds but we did talk about I Write The Songs (for which Bruce received an Emmy) and how it was actually a hymn, to the God who "lives forever" and "makes the whole world sing." Bruce and Mike Love and the band (now including Jeffrey Foskett) gave a non-stop, 100+ minute show swirling with car tunes, surfing songs, and even some pet sounds. The video clips correlated to many of the songs provided an enlightening visual context to the life and times of those who grew up to this Made in America soundtrack. A great night for this lifetime fan, especially when my grand daughter was part of the impromptu Barbara Ann dance team! He didn't take your cell phone and throw it up into the balcony, did he??? (Didja hear about that one? About a week ago ... in Indiana I believe ... Frampton was doing a show and some front row fan was annoying the hell out of him, taking pictures and shooting video. Peter apparently asked him several times during the show to stop and put the cell phone away ... but the guy just kept on shooting. Finally, he stopped the show and said to the guy, "Well, if you're going to insist on continuing to take photos and video can I at least see what they look like?" The idiot hands Frampton his phone, who then immediately proceeds to throw it up into the balcony of the theater!!! On September 9th I'll be heading over to The Ridgefield Playhouse to see the British Invasion tour starring Denny Laine, Chad and Jeremy, Billy J Kramer, Gerry and the Pacemakers, Mike Pender's Searchers, and for Ridgefield, CT only, Peter Asher. It is in honor of the 50th year of The British Invasion. I took this tour schedule off of the Chad and Jeremy website ... it is very limited engagement and I was just told that NO more dates would be added. Uhm Kent ... there is nothing in the Midwest. Who did you guys p--- off? Boy George and Culture Club have regrouped for both a tour and a new album. So far six U.S. dates have been announced ... 11/15 - Rancho Mirage, CA - Agua Caliente Casino Resort Spa; 11/17 - Oakland, CA - Fox Theater; 11/19 - Los Angeles, CA - Shrine Auditorium; 11/22 - Las Vegas, NV - The Pearl; 11/25 - New York, NY - Beacon Theatre and 11/28 - Atlantic City, NJ - Etess Arena. One reader recently was wondering if footage existed of Petula Clark and Tony Hatch working together like the YouTube video of Cilla Black and Burt Bacharach recording Alfie. I recently finished reading the Burt Bacharach bio titled “Anyone Who Has A Heart”. I disregarded all the bad review and went out and purchased it because I’m such a huge Bacharach and David fan. If footage does exist of Clark and Hatch, I’m sure you would witness a collaboration rather than the task mastering of Burt Bacharach on the 29 take rendition of “Alfie”. The final product made it all worth wild as far as Burt was concern. There’s a quote in the book from Mike Myers: If you’ve seen the video of that session on YouTube, Burt breaks Cilla in the studio. He was going to do it until it was right and I love the quote from her. “I wanted to foo-kin kill him but he was so foo-kin gorgeous”. I love this song and it’s one of Burt’s favorites. I think when Hal David gave him the lyrics he may have wrote them about Burt rather than an Alfie movie character. There are many great renditions of this song but the worst and best in my opinion is done by Cher. I hated the Phil Spector influenced Bono Brill Building rendition but if you check out the old Cher Show (minus Sonny) on YouTube you’ll see a brilliant performance of this song. I’m so glad that there were so many ups and downs in the Dionne Warwick / David and Bacharach collaborations. Dionne appeared to want almost every successful song that the duo put out, even when many of them she originally tuned down. To her credit, there may have never been the song “Don’t Make Me Over” if Dionne hadn’t yelled those word at David / Bacharach because they chose Jerry Butler rather than her to originally record “Make It Easy On Yourself”. What a pity it would have been if all we had was Dionne’s Greatest Hits Volume 1, 2, 3, 4, 5. I would hate to think we would be deprived of a Cilla or Cher’s “Alfie”, a Dusty’s “Look Of Love” or Jackie’s “What The World Needs Now”. Paul Revere has officially retired and the band is now called Paul Revere's Raiders. 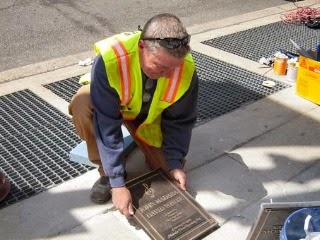 His son Jamie is now officially in the band ... a sad day. Paul Revere is a rock 'n' roll icon that does not get the credit he deserves for keeping the great Raiders songs going with his band, most members of which have been with him since the 70's. These Raiders are fabulous and hopefully they will keep the music alive. Here's some more press for the brand new "live" Jim Croce CD we told you about a few weeks ago, this time from one of our local newspapers ... sent into Forgotten Hits by Bill Hengels, who actually recorded the concert at Harper College back in 1973! Croce performed before a capacity crowd February 2, 1973, on the Palatine campus. Ten of those songs including "You Don't Mess Around With Jim" and "New York's Not My Home" appear on the new album, Lost Time in a Bottle. The 24-track album also features several demo recordings such as renditions of his classics "Bad, Bad Leroy Brown" and "Time in a Bottle." 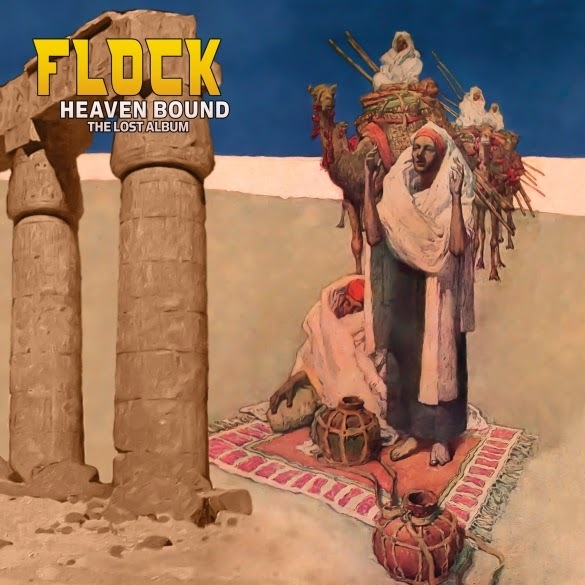 Los Angeles-based Cleopatra Records will release the album July 22 as a CD and digital download and later on vinyl. The concert was described as a showcase of both Croce's musical talent and his comedy routines, according to an article that appeared in Harper's newspaper, The Harbinger. "In an interview before the concert, Croce said that 'college students are pretty sophisticated listeners,'" the singer told student reporters Mike Morey and Greg Fife. Later that year, Croce died in a plane crash just an hour after wrapping up a concert at Northwestern State University in Louisiana. The next day, one of his most iconic singles – "I Got a Name" – was released. Five of Croce's songs landed in Billboard's Top 10. I am home sick from work today so I tuned in to Hoda and Kathi Lee this morning. They were celebrating Kathi Lees' birthday which is actually tomorrow. Anyway, Neil Sedaka was a surprise guest for Kathi Lee. She apparently has known him for years. He sang "Happy Birthday Sweet Sixteen" only he changed the lyrics to fit Kathi Lees' birthday. Then he and Kathi Lee sang her favorite song by Neil. It was "The Hungry Years". What a powerful song. I don't know how popular this song was but it has to be one of my all time favorites, too. The new documentary Glen Campbell: I'll Be Me will open on October 24 in New York and Nashville followed by a rollout to theaters across the country. Directed by actor, director and producer James Keach, the film chronicles Campbell's life and his final 151-date "Goodbye Tour" while dealing with the diagnosis and effects of Alzheimer's disease. The film includes vintage footage of Campbell from throughout his career along with performances of his greatest hits from the tour. Among those participating in the film are Bruce Springsteen, Bill Clinton, The Edge, Paul McCartney, Jay Leno, Vince Gill, Jimmy Webb, Blake Shelton, Sheryl Crow, Keith Urban, Brad Paisley, Steve Martin, Chad Smith and Taylor Swift among many others. Check out this interview. After watching this I'm not sure if I'm 78 or 108. Time goes by so fast when you look at your life! I hope things are good with you, my friend! Eileen told me that she heard this song for the first time this past weekend, so thought I would share it all with you. It charted at #12 in 1972. Now here's a truly forgotten hit. I doubt I've heard this one since the summer of '72. More on this '70's music comeback from Paul Grein, formerly of Billboard Magazine (courtesy of Tom Cuddy)! Who would have ever predicted the #1 album in the country in August, 2014, would consist of 60s and mostly 70s tune? Life is full of WONDERFUL surprises! Former Billboard writer, Paul Grein, who is now a blogger for Yahoo Music, has all the details. It’s too bad that radio legend Casey Kasem died two months ago. I’ve got a feeling he would have loved the soundtrack to "Guardians Of The Galaxy: Awesome Mix, Volume 1, which jumps from #3 to #1 in its second week on The Billboard 200. After all, he introduced seven of the 12 songs on his weekly American Top 40 countdown. The Five Stairsteps' “O-o-h Child” was on the very first AT40 countdown in July, 1970. Rupert Holmes' “Escape (The Pina Colada Song)” hit #1 in December 1979, when the show was in its 10th year. James Gunn, who directed and co-wrote Guardians Of The Galaxy, spearheaded the use of oldies in the movie. The movie ranked #2 at the box office after ranking #1 last weekend. Here’s a little background on the three songs on the album that weren’t top 10 hits. Marvin Gaye & Tammi Terrell's original version of “Ain't No Mountain High Enough” reached #19 on the Hot 100 in July, 1967. Three years later, Diana Ross took the song to #1. David Bowie's “Moonage Daydream” was a track on his 1972 album The Rise And Fall Of Ziggy Stardust And The Spiders From Mars.The Runaways's “Cherry Bomb” “bubbled under” the Hot 100 (at #106) in August 1976. And, speaking of '70's music, you'll want to check out this upcoming brand new release from Time / Life ... it's The Midnight Special, back out on DVD!!! I'd like to nominate this one for clip of the week. 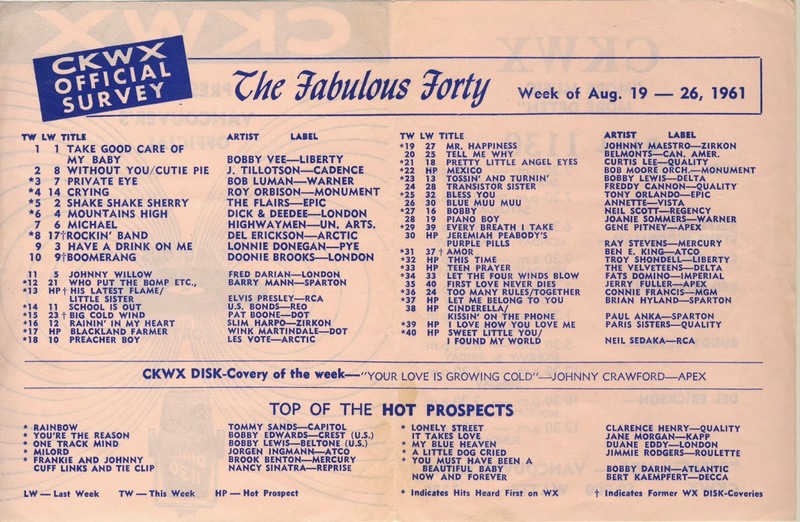 Here's a GREAT looking chart from 1966 ... nothing particularly interesting or unusual in their Top 20 Listing ... but don'tcha just love the way the record store AND the record company got together to advertise their latest wares ... back in the days of co-op advertising?!?!? 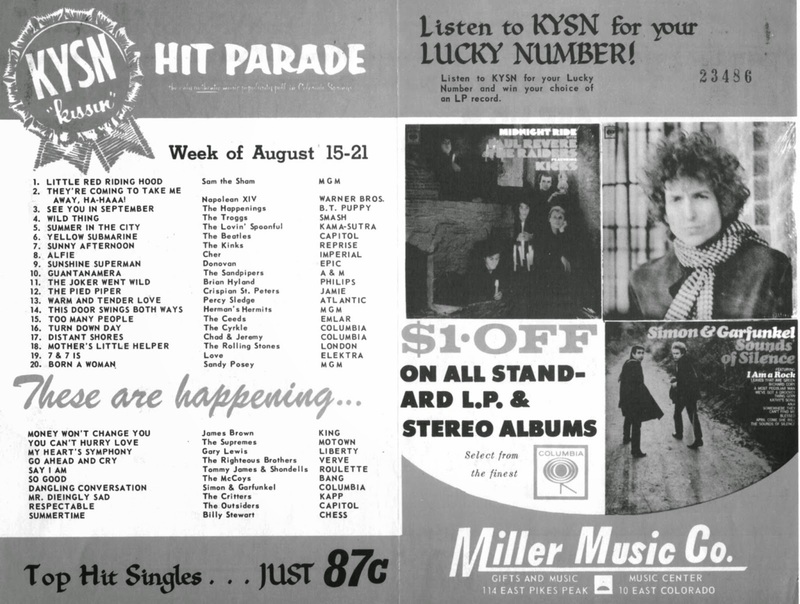 What a cool looking chart, showing the latest LP releases by Paul Revere and the Raiders, Bob Dylan and Simon and Garfunkel ... with a dollar off all standard albums ... and only 87-cents for the latest hit singles. I Love It!!! 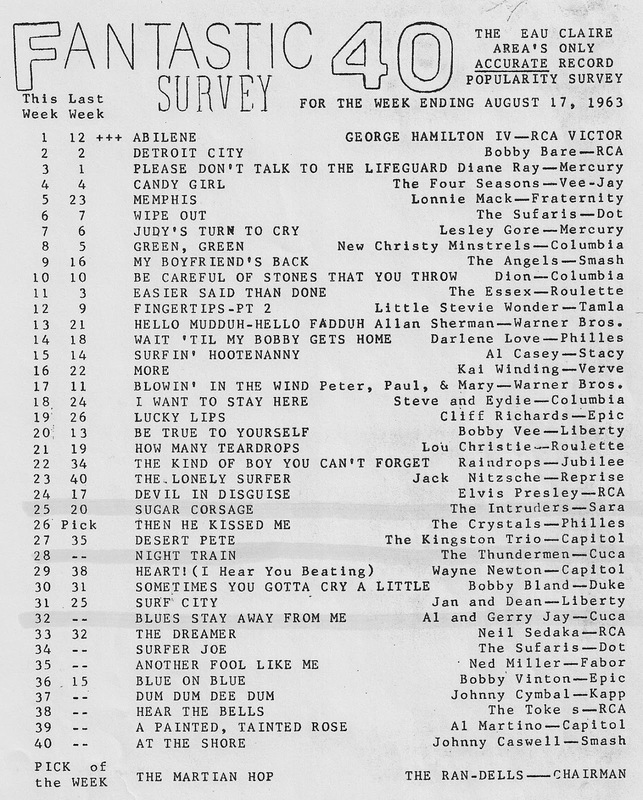 This Fantastic 40 Survey from 1963 (Eau Claire Area's ONLY Accurate Record Popularity Survey) shows Elvis jumping up seven places to #17 with his latest, "Devil In Disguise" ... and then right below that you'll find a CKWX Chart from two years earlier where Elvis premiers on the chart with a two-sided hit, "His Latest Flame" / "Little Sister", at #13. 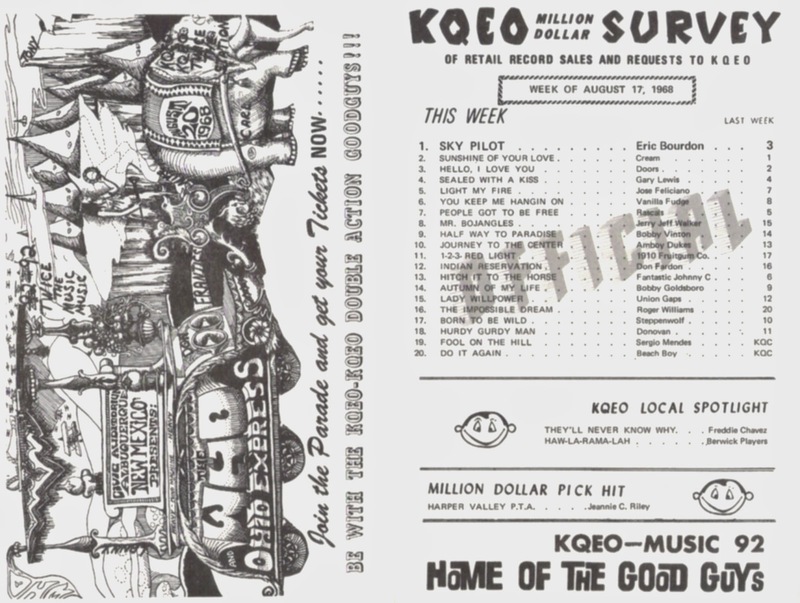 You'll find novelty king Ray Stevens on the CKWX chart above ... his latest piece of nonsense on the CKWX chart above ... "Jeremiah Peabody's Poly Unsaturated Quick Dissolving Fast Acting Pleasant Tasting Green And Purple Pills" ... premiers at #30. And then, just seven years later WBBF was taking him seriously enough to rank his stab at mainstream pop (with even a little bit of social commentary), "Mr. Businessman" at #1. 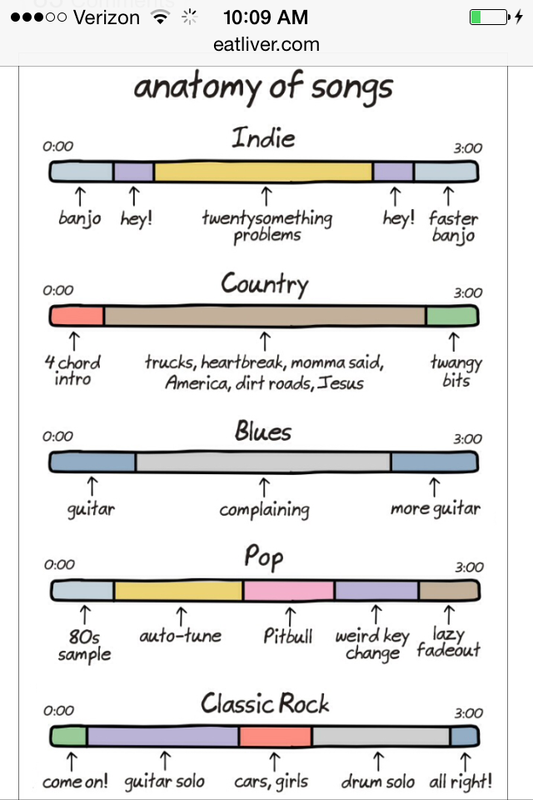 This chart also features the original hit version of "Indian Reservation" by Don Fardon (done three years before Paul Revere and the Raiders took their version all the way to #1), some classic bubblegum by way of The 1910 Fruitgum Company ("1,2,3 Red Light) and pure schmaltz by the likes of Bobby Goldsboro ("Autumn Of My Life", #14) and Roger Williams ("The Impossible Dream", #16.